Starring Martin Freeman, Ashley Jensen, Alan Carr and Marc Wootton comes the ultimate British feel-good Christmas film for the whole family. 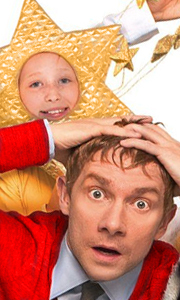 This Christmas, primary school teacher Paul Maddens (Martin Freeman) is being charged with the biggest challenge of his life - directing the school's musical version of the Nativity. Competing against the posh local school for the honour of best reviewed show in town, the stakes are raised when Pau.. The sparkle and shine of Christmas once again comes to life in this home-grown gem for all the family, starring a host of British favourites, including David Tennant, Marc Wootton, Joanna Page and Pam Ferris. This Christmas, the unforgettable pupils of St. Bernadette’s are heading to Wales to compete in the National Choir Contest; "A Song for Christmas". New supply teacher Mr Peterson has the unenviable task of trying to curb the hyster.. The sparkle and shine of Christmas once again comes to life in this home-grown gem for all the family, starring a host of British favourites, including David Tennant, Marc Wootton, Joanna Page and Pam Ferris. This Christmas, the unforgettable pupils of St. Bernadette’s are heading to Wales to compete in the National Choir Contest; “A Song for Christmas”. New supply teacher Mr Peterson has the unenviable task of trying to curb the hyster.. This Christmas the children of St Bernadette’s face their biggest adventure yet! When their new teacher Mr Shepherd loses his memory as well as Archie the Donkey, it's up to them to save the day and reunite him with his fiancee in New York. Prepare for a race against time as they embark on a journey involving fantastic flashmobs, excitable elves and plenty of Christmas fun.From director Debbie Isitt and starring Martin Clunes, Catherine..
Own Nativity! / Nativity 2 - Danger In The Manger! / Nativity 3 - Dude Wheres My Donkey DVD from Deff, DVD, Blu-Ray & 4K Video Specialists - Free UK Delivery..
Own Nativity! / Nativity 2 - Danger In The Manger! DVD from Deff, DVD, Blu-Ray & 4K Video Specialists - Free UK Delivery..